Nearly 3 billion people, or 39.4% of the world’s population, used a mobile phone to access the internet in 2018, according to eMarketer. To meet the explosive demand, mobile ad spend has scaled as well, growing by nearly 30% in 2018 to reach $184 billion. Further double digit growth is predicted through 2020 when it is expected to eclipse $263 billion. An increasingly large piece of the mobile ad spend pie is app install ads. The rise of apps as the ultimate destination to foster brand loyalty and engagement has resulted in a significant rise in spend. According to AppsFlyer forecasts, app install advertising will total $38.9 billion in 2018 and no less than $64.1 billion in 2020 — a 65% leap. However, this kind of growth will also lead to heightened competition in the market, making the path towards app marketing profitability harder to conquer. Clearly, only app marketers who will rely heavily on data will be successful. One key piece in the puzzle is to understand where the market headed in 2018, and where it will head in 2019. 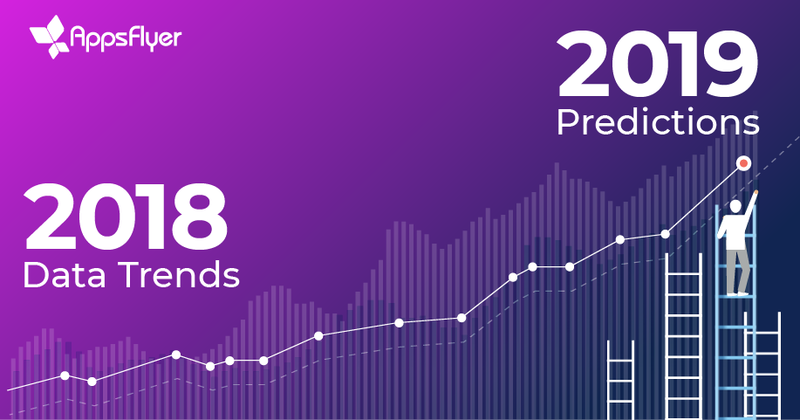 Here are the Top 5 AppsFlyer data trends for 2018, and one more bonus stat about the growth in the share of apps measuring subscription revenue. Organic app discovery remained broken in 2018, leading more and more apps to increase their user acquisition budgets. There was an 11% rise in the share of non-organic installs (NOI) among apps with a marketing budget in 2017 and a further 12% in 2018 to reach 55% of installs. A platform breakdown has Android only slightly ahead of iOS. Among all installs (without setting a marketing spend bar) the non-organic share reached 43% in 2018. Clearly, apps with a UA budget (not even a large one at 3k+ NOI a month) are increasingly reliant on non-organic installs to generate demand. We can see that marketing growth is widespread with 57% of apps having more non-organic installs than organic. The largest rise in the share of non-organic installs was seen in Casual Games (+29%), and Health & Fitness (+24%), while News and Food & Drink recorded the largest drops (-19% and -7% respectively). What’s in store for 2019? The overlying trends we’ve seen in recent years will continue, be it broken organic discovery, increased reliance on non-organic installs, and, in parallel, a higher level of data savviness and confidence to drive profitability of marketing investment. Furthermore, as more dots will be connected across channels, the consumer journey will open up, shedding more light on the effects of marketing. As such, some installs whose source was unknown (and therefore labeled as organic), will become known. This will lead to a further increase in the share of installs attributed to marketing-driven activity on different channels. Overall, we can see that nearly 70% of apps have increased their retargeting activity, while 60% had more installs. However, the jump in retargeting was much higher than the relatively modest install increase. Considering the challenge in app retention (see full report here) and the smarter of use of data to effectively re-engage existing users, that is expected. The leap in retargeting was largely driven by shopping and travel apps. These apps are laser-focused on generating long-term loyalty and a stronger relationship with existing users. They are therefore much more inclined towards using retargeting. This is particularly true for the top 50 shopping apps, 35% of which have increased retargeting activity at the expense of UA. In gaming, we can see that almost 60% of apps decreased user acquisition activity after a year. This can be explained by the fact that the average game has a limited shelf life due to the nature of games and the intense competitive landscape. The average game may also experience an increase in effective media cost over time. As a result, the number of installs drops as interest wanes, leading to reduced spend. What’s in store for 2019? There are several reasons leading to increased use of retargeting. Chief among them are the growing importance of brand and customer loyalty for eCommerce apps; the heightened value of IP among gaming apps; continued retention woes; and an enhanced use of data, informing sharper segmentation and the effectiveness of retargeting. A view from above on in-app purchase (IAP) revenue trends shows that the average user generated less in 2018 than in 2017. Overall, the decrease is not substantial, but when we drill down into platform data, we can see that main cause of this drop can be attributed to Android users. It is a well documented fact that gaming app marketers are much savvier than their non-gaming counterparts. In 2018, a significant gap still separates the two groups, and this is especially evident in the ARPU figures above. This gap also explains why the percentage of non-organic installs in gaming apps is much higher than non-gaming apps (see insight #1 above). Thanks to their data-obsessed approach, gaming apps can invest more in marketing and reap the rewards of increased revenue from acquired users. A country breakdown shows that China and Korea experienced the largest ARPU gains in 2018, while Brazil and India suffered the biggest losses. We can see that China’s explosive growth goes beyond volume, while Korea’s uplift is largely driven by gaming apps leveraging the massive popularity of games in this market. Despite the surge in developing markets like India and Brazil, their growth is centered on volume. When it comes to monetization, there is sharp decline. Having said that, low media cost and a sizable audience can drive profitability for marketers in these regions. What’s in store for 2019? The average revenue from in-app purchases is harder to predict. It all depends on whether non-gaming apps will dive deeper into revenue-driven optimization. On the one hand, many non-gaming marketers will realize they need to improve their data-driven marketing skills. On the other hand, as more and more traditional brands enter the performance-driven app market, it will take time before they hone in on these skills. Ad monetization is experiencing significant growth in the app space, but this revenue stream is still limited to gaming (85% of apps monetizing with ads in our database are games). Gaming app marketers are laser-focused on maximizing revenue from multiple streams: not only was their ARPU higher (see point #3 above), but an increasingly large number of gaming apps — 135% share increase to be exact — started measuring ad revenue in 2018. The growth is driven by casual and hyper casual apps, as we’ve detailed in our recent State of Gaming App Marketing 2018 report. Hyper casual games, with their simple pick-up-and-play mechanics, have been the rising star in the gaming space this year with massive 3.5x growth in the share of gaming app installs. The share of IAA among midcore & strategy games remained consistent at around 30%. What’s in store for 2019? The share of ad revenue will continue to rise, as will the number of apps leveraging the potential of this key revenue stream. Much of its growth will be fueled by the explosion of video ads, driven largely by demand for rewarded videos in casual games. In addition, the use of higher quality vertical video is on the rise, which could spark increased interest among non-gaming apps as well. In the past several years, we’ve seen app install fraud come in waves as part of a high stakes arms race between fraudsters and protection solutions. After the rise of install hijacking and device farms, fraudsters began developing far more sophisticated bots that try to mimic user behavior to bypass protection. The height of this wave was in August when we saw millions of attacks on a daily basis. When we found a way to block these forms of bots, their numbers gradually decreased. Instead, a new wave of next generation device farm attacks emerged, this time with the use of emulators rather than physical devices we’ve seen placed on racks in the thousands. However, the scale of their attacks were nowhere near the scale of bots we experienced during the summer, which explains the overall drop in recent months. Having said that, the global fraud rate is still alarmingly high, as nearly 1 in 4 installs is fraudulent. The most targeted regions are APAC (and within them Southeast Asia and India) and LATAM, while North America is enjoying relatively low rates of attack, especially towards the end of the year. Clearly, high payout is not the leading factor that attracts fraudsters to target certain regions over others. Instead, it appears to be vulnerability to fraud, especially among non-gaming apps. Overall, there was a significant difference in the rate of fraud in gaming vs. non-gaming categories, with the latter suffering much higher rates. This is no surprise as gaming marketers are typically far more advanced than non-gaming marketers, and this advantage is also translated into far more effective fraud protection. What’s in store for 2019? The game of cat and mouse will continue, and judging by past dynamics, it is likely that we’ll see a rise in attempted fraud — this time even more dangerous than previous forms — after the relative drop in H2 2018. The rise of the app subscription economy started to gain ground when app stores offered developers 85% of the revenue after one year (instead of the standard 70%). It then took off thanks to the explosion of music and especially video streaming, which was made possible by the increasing global availability of 4G infrastructure; more powerful and affordable smartphones; and low cost data plans. According to our data, more and more verticals are measuring subscription revenue beyond entertainment – mostly health & fitness, but also utility and education apps. It is also worth noting that there was a significant rise in the number of games measuring subscription revenue, particularly among the more advanced midcore & strategy categories. However, the overall share of gaming apps that measure subscription revenue remains relatively small. What’s in store for 2019? Further infrastructural improvements (5G) and the predicted spike in mobile video consumption will mean streaming services will continue their upward trajectory, leading more apps to seek a slice of the pie. In 2019, the industry will experience yet another shakeup when Disney introduces its own streaming service to rival Netflix, Amazon, and others. The mobile app install space is experiencing significant growth and will continue growing in the coming years with massive smartphone penetration across the globe. However, on a micro level, mobile app marketers are facing many challenges — namely retention, monetization and fraud. Clearly, the use of data separates the successful from the unsuccessful. The best proof of this is the clear line that can be drawn between the average gaming app and the average non-gaming app. The former relies heavily on data and is laser focused on revenue-driven optimization, while experiencing much lower rates of fraud. The opposite can be said about the latter. Hire data analysts and scientists to crunch the data that you measure. Brush up your own data-driven skills and learn SQL, Excel and even Python. You don’t need to be a developer or a data scientist but you should have enough technical understanding to work in synergy with them and challenge them. Shani is the Head of Content & Mobile Insights at AppsFlyer. He has over 10 years of experience in key content and marketing roles across a variety of leading online companies and startups. Combining creativity, analytical prowess and a strategic mindset, Shani is passionate about building a brand’s reputation and visibility through innovative, content-driven projects. You can follow him on LinkedIn.